Fitting rooms can feel like a coffin for your self-esteem. Even the kindest “Everything OK in there?” from a salesperson can sound like the buzzing of a million mosquitoes to a stressed-out shopper. Well, that was before Oak Labs‘ smart fitting room. Now the humble fitting room mirror can be the salvation of a shopping trip. No longer is it your enemy, reflecting — and sometimes magnifying — all the little negatives about an outfit and the experience of prying oneself away from the computer and going to an actual store. 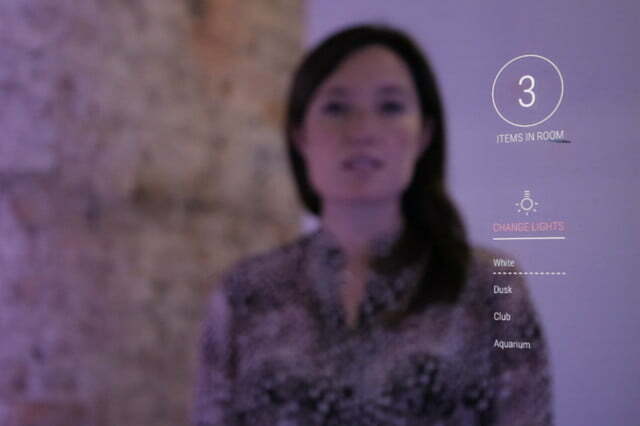 Now, thanks to Oak Labs, fitting room mirrors are wising up enough to help you shop. You can find other sizes and colors of that suit that’s almost right, or by keeping the hovering salespeople at bay, summoning them, or sending them for items with a tap of its touchscreen. The Oak Fitting room is an interactive experience that helps brick-and-mortar stores step their game up to compete with the ease of shopping online. If your house is connected, your stores should be too. What this means for the average Joes stepping into their fitting room is a more customized experience. Say you go into a store and grab some goodies you want to try on. 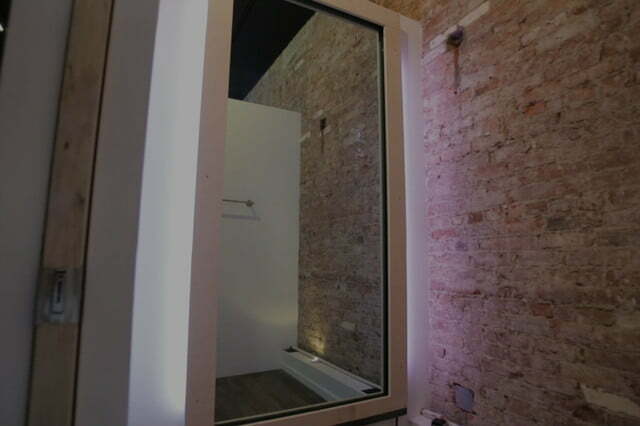 Once you step into the fitting room with your swag, you can set the mood — yes, these fitting rooms have mood lighting. Prepping for an evening wedding? Change the lighting to one of the options unique to the brand — in the Polo store, for instance, “evening at the polo bar” would be a good choice. 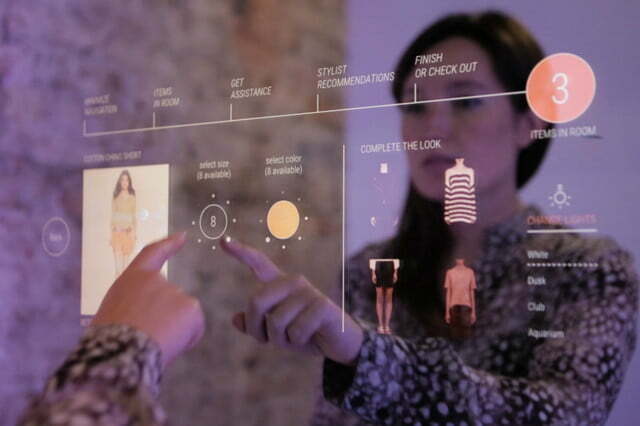 The room knows which items you brought with you to try on and the touchscreen mirror displays them. On the mirror you can run through item details, and if you try a piece on and see it’s not quite right, you can pick out a different size or color with a simple tap. When you’ve found what you want, you can check out with another tap. It’s like Oak Labs combined the privacy and ease of shopping online at home with the classic and classy retail experience, including the chance to try things on. Emerging from the fitting room to search for a piece in a different size or color only to find it’s out of stock are annoyances of the past. Even stylist recommendations for a full look are included. And if you’re not sure about buying now, you can send an item summary to your phone via text message. If you opted to swap out a piece, the request pops up on a sales associate’s iPad, and they can respond with a note on the mirror. No more stranger’s feet pausing outside the fitting room door; no more unwanted check-ins, like “How did you like everything?” Even better, the Oak Labs fitting room experience removes language barriers by translating requests into common languages, including Spanish, Chinese, Portuguese, Japanese, and Italian. From the consumer standpoint, this is all well and good; it’s a natural extension of smart-mirror technology already available at home. For businesses, Oak Labs presents a unique opportunity to gather info about what their buyers like (or dislike). First off and most obviously, retailers will be able to see how much people love the new fitting rooms — how often they’re used, for how long, and how often that turns into sales. The fitting rooms also track SKUs and relay that info to merch teams. This is aside from the fact that all the little things that annoy us about fitting room experiences aren’t good for the store, either; waiting for help from an associate or for them to check stock, getting dressed to go find it or the item you need, all of that can mean the death of a sale, but the Oak Labs fitting room system negates it. Ralph Lauren’s Polo flagship store on Fifth Avenue is the first location to feature the Oak Labs Fitting Room. Other retailers will no doubt hop on board in the coming months, as Oak Labs uses its $4.1 million from Wing Venture Capital to continue growing. This massive overhaul of the way the retail experience is handled could convince this primarily online shopper to brave brick and mortars again. At least, if they have the Oak Labs Fitting Room installed.